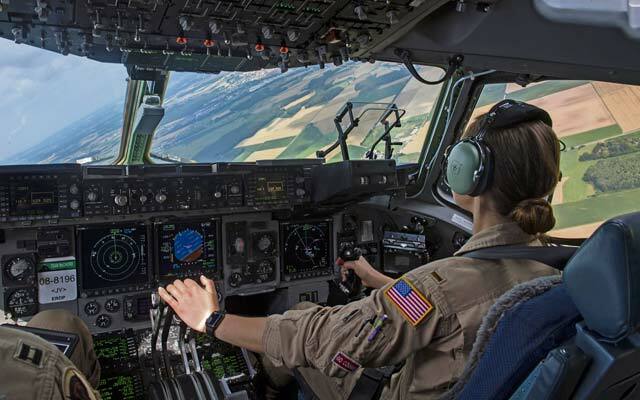 U.S. Air Force Reserve 2nd Lt. Reily Finnelly, 97th Airlift Squadron pilot, flies a C-17 Globemaster III to transport U.S. Army 2nd Cavalry Regiment Interim Armored Vehicle Strykers July 14 to Plovdiv Airport, Bulgaria. The U.S. Air Force’s capability for rapid mobility allows U.S. and allied power to be projected quickly to anywhere on the globe. 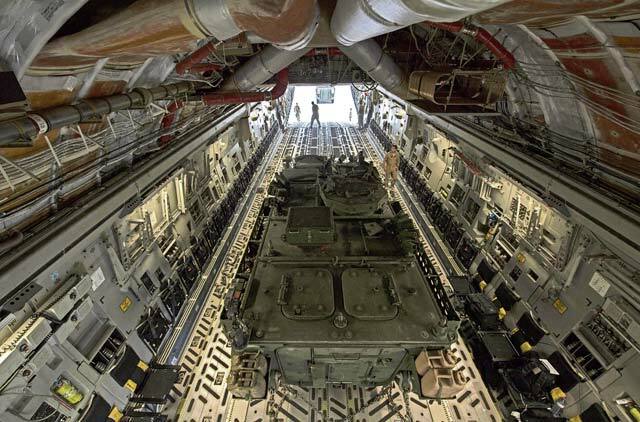 The U.S. Air Force airlift provides the capability to deploy armed forces and assets anywhere in the world within hours. U.S. Air Forces in Europe works with Air Mobility Command and supports a total-force effort to execute rapid global mobility and enable global reach. While in the European theater, USAFE and AMC Airmen and aircraft support global reach by focusing on four core mission areas: airlift, air refueling, air mobility support and aeromedical evacuation to support NATO Allies and partners and ensure a strong Europe. As a part of this effort, U.S. Air Force Reserve Airmen based out of Ramstein flew in a C-17 Globemaster III from Joint Base Lewis-McChord, Washington, to deliver U.S. Army 2nd Calvary Regiment Stryker vehicles from Nuremberg, Germany, to Plovdiv, Bulgaria. The crewmembers aboard the C-17 were comprised from the 97th Airlift Squadron, 313th Airlift Squadron and 446th Airlift Wing, Joint Base Lewis-McChord, Washington; 729th Airlift Squadron and 452nd Air Mobility Wing, March Air Reserve Base, California; and 437th Aircraft Maintenance Squadron and 437th Airlift Wing, Charleston Air Force Base, South Carolina. This patchwork crew demonstrates the total and diverse force that can come together and complete any mission put before them. Delivering 2nd Cavalry Regiment Stryker vehicles to Bulgaria is an example of how assets are ready and postured to assure, deter and respond as a joint and combined team in the event a U.S. response is required. A U.S. Army 2nd Cavalry Regiment Interim Armored Vehicle Stryker drives out of a U.S. Air Force C-17 Globemaster III July 14 at Plovidv Airport, Bulgaria. 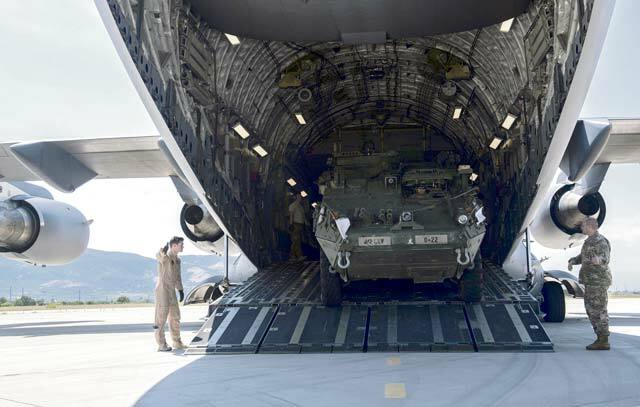 U.S. Air Forces in Europe airlift will also deliver Stryker vehicles in support of upcoming exercises Swift Response 17-1 and Saber Guardian 17. These U.S.-led multinational exercises ensure high-readiness forces can respond to any threat or crisis in a timely manner. A U.S. Army 2nd Cavalry Regiment Interim Armored Vehicle Stryker drives out of a U.S. Air Force C-17 Globemaster III July 14 at Plovdiv Airport, Bulgaria. 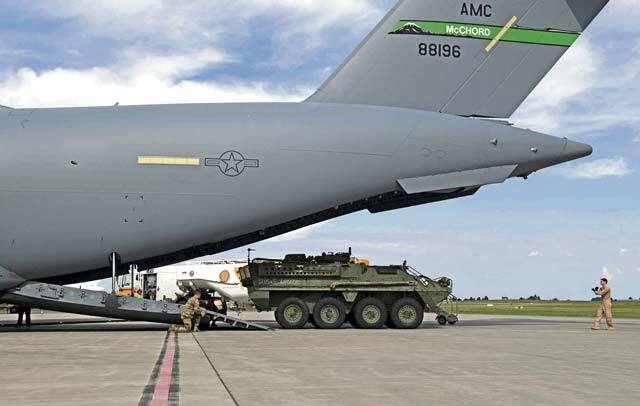 Two U.S. Army 2nd Cavalry Regiment Interim Armored Vehicle Strykers are loaded into a U.S. Air Force C-17 Globemaster III to be delivered to Bulgaria July 13 at Nuremberg Airport, Germany. 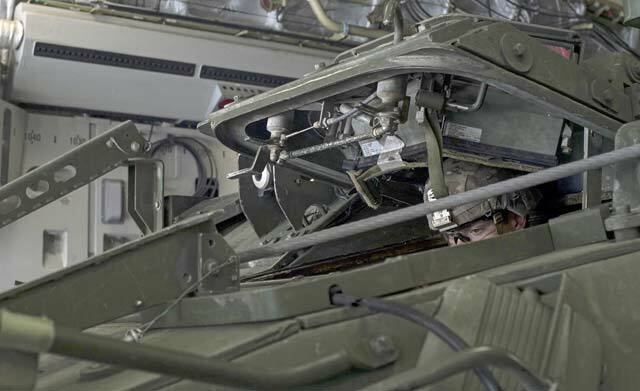 Delivering Stryker vehicles to Bulgaria is an example of how assets are ready and postured to assure, deter and respond as a joint and combined team in the event a U.S. response is required. A U.S. Army Soldier prepares to drive a U.S. Army 2nd Cavalry Regiment Interim Armored Vehicle Stryker out of a U.S. Air Force C-17 Globemaster III July 13 at Plovdiv Airport, Bulgaria. The U.S. Air Force’s capability for rapid mobility allows U.S. and allied power to be projected quickly to anywhere on the globe. The 86th Airlift Wing hosted the fourth annual Mudless Mudder for resilience day July 21 on Ramstein.